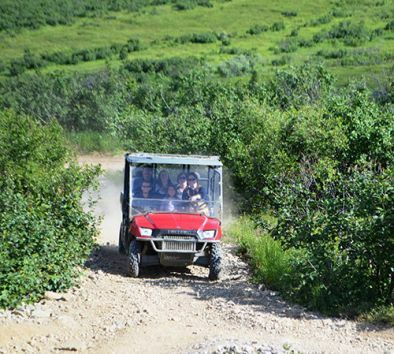 Take an exciting personal and private trip into the wilds of Alaska on a fantastic covered Polaris® ATV while your experienced guide drives you though the backcountry of Alaska—the ultimate back country exploration tour awaits! Experience an amazing adventure back in the wilderness hunting Alaskan treasure. Feel exhilarated while working together to find hidden views, secret sights, quarts and granite rocks, coal, and much more! Leave a treasure in the geocache and pick one out for you to take home! This experience takes you back on old coal mining trails and spills you out onto the Dry Creek River Bed where Athabascan Indian artifacts have been found in archaeological digs! You will be navigating the trails with a GPS and each mini mystery will get you closer to finding a rustic pavilion where a full service family style meal is served to satisfy any adventurer’s appetite! Dress in warm layers. Bring a camera. Ride will be slightly bumpy. The ATV can accommodate up to 5 passengers in addition to your driver-guide. Time on treasure hunt and meal is approximately 3½ hours.